In 2012 Toyota may offer the most economical fossil-fuelled car in Australia when its 2.6L/100km Prius Plug-in Hybrid Vehicle (PHV) goes on sale. However, its other distinguishing feature – the ability to travel 20km in pure electric mode – is “probably not the best range for Australia”, Toyota Australia’s senior executive director of sales and marketing, David Buttner, conceded this week. 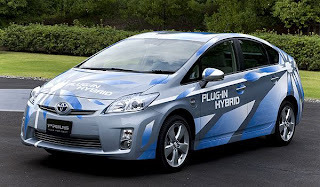 Toyota have received federal regulatory approval to begin field testing of its plug-in Prius hybrid, the company this week announced that the vehicle will be loaned to the Victorian government and four corporate fleets yet to be named. All will be involved in evaluating whether the experimental plug-in hybrid works satisfactorily in a local setting prior to its commercialization in 2012. The Prius PHV is based on the existing third-generation Prius, which was released here in July 2009, but has been modified to accept an electric charge from an external power source. It also uses a 5.2kWh lithium-ion battery pack in place of the existing nickel-metal hydride battery pack (as also used in the local Camry Hybrid built at Altona), which boosts its voltage rating from 201.6 to 345.6 and extends its range in pure electric mode from 2km to 20km. The plug-in Prius employs the same 73kW/142Nm 1.8-litre petrol engine and 60kW/207Nm electric motor as the standard Prius hybrid. Mr Buttner this week conceded the 20km range was perhaps not enough for Australia but was dictated by studies of typical driving distances in Europe, which revealed 80 per cent of car journeys were of less than 25km. However, he said that ‘range anxiety’ (where consumers are concerned that battery range is insufficient to complete a journey) is obviated by the Prius PHV’s on-board petrol engine. “If you forget to plug it in, you will still be able to drive to work, and you will be able to continue to drive beyond the range of the battery pack,” said Mr Buttner. The PHV can be charged using a 15-amp electric outlet (although Toyota says a conventional 10-amp domestic lead will be developed for production), with a recharging time of about 100 minutes on 220V. The lead plugs into a charge point concealed behind a flap on the front left guard. It is 135kg heavier than a conventional Prius and loses 54 litres of cargo capacity to permit storage of the larger battery pack. Maximum speed in pure electric mode is about 100km/h (compared with 70km/h for the regular Prius in electric mode), and if this is exceeded the petrol engine cuts in, as it does under hard acceleration or when the battery pack runs out of charge. Real-world fuel consumption and emissions obviously depend on how much time is spent in electric mode, but the official average figures are 2.6L/100km and 59g/km. This compares favourably with the regular Prius, which emits the lowest amount of CO2 of all new vehicles currently sold in Australia (89g/km) and returns 3.9L/100km – slightly more than the Ford Fiesta Econetic, which is the current Australian fuel economy leader with 3.7L/100km. The Prius PHV global trial consists of 600 cars that are being evaluated in countries including Japan, USA, UK, France, Canada and New Zealand. The Victorian trial includes charging infrastructure supplied by Better Place, which will also supply software to allow the trial to be adequately monitored, providing real-time information on odometer readings, vehicle locations and battery charge levels. Earlier this month, Toyota Motor Corporation announced that it had sold its two-millionth Prius since the hybrid was first launched in Japan in 1997. It took more than 10 years for Toyota to reach one million Prius sales, but the second million was racked up in less than two-and-a-half years, reflecting the technology improvements across three generations and broader global acceptance and demand of the green vehicle. According to Toyota, the total includes almost 940,000 deliveries in North America, more than 825,000 in Japan, 206,000 in Europe and 40,000 in the rest of the world, including more than 16,000 in Australia since the Prius was launched here in October 2001. The Prius is currently sold in more than 70 countries and last year Toyota achieved a record 400,000 sales. That total has already been eclipsed this year, largely due to strong sales in Japan. Toyota’s overall sales of hybrid vehicles – thanks largely to the Camry Hybrid – now exceeds 2.8 million.